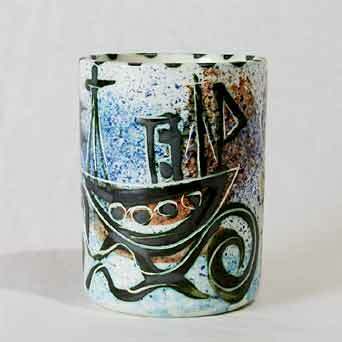 Early Celtic Folk boat mug II - 4⅜" (111 mm) high. Mousehole (pronounced "mous'le") is a fishing village two miles south of Penzance. Buy a local a pint of 'Tinners' in the Ship Inn on the harbour, and he'll tell you about the dire problems of the Cornish fishing industry and the injustices of EC legislation. These people, who work so hard when they have the chance - you could lose a small coin in the cracks in their hands - are watching their livelihood slowly ebb away. Not so in the mid 1960s when Bill and Maggie Fisher set up Celtic Pottery there. Maggie was a Canadian with a keen business sense. The south coast of Cornwall has strong links with Canada; if you passed through Newlyn at the end of the twentieth century you would see more maple leaf flags than Union Jacks or Kernow crosses. The design for which Celtic was to become famous, Folk, was one of Bill's. Heraldic designs - aggressive cockerels with claws at the ready - were the order of the day. Maggie split with Bill and moved the pottery to Newlyn, the next village along the coast towards Penzance, taking the Folk design with her. Here she met up with Ev Stevens who ran Newlyn's Gwavas Pottery. Ev (short for Everidge) joined Maggie, and his range of designs were amalgamated into Celtic to become the Medallion range. Medallion proved to be as popular as Folk, and Celtic Pottery is remembered for just these two designs. In the late seventies Celtic became Sunset Ceramics making a different range of wares, but the sun set on Sunset within a few years. Maggie is still a very successful businesswoman. She gave up pottery and now runs trading companies in various parts of Cornwall.